Adding a deck is one of the most cost effective long term additions you can make to a home. A beautiful custom deck adds value to your home by expanding the living area and adding years of family enjoyment to your backyard living space. A deck can adapt your home to non level landscapes and provide an elevated overlook to your neighborhood. A custom deck can also be combined with a dock, creating a seamless environment to waterfront property. 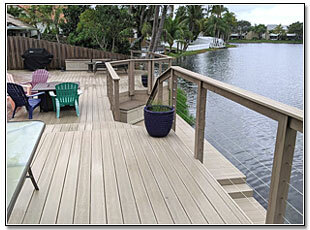 Morrison Contractors has been building custom decks in South Florida for nearly 30 years. Our decks are designed by structural engineers who are experts in load bearing, wind uplift and longevity construction issues. Our engineer predetermines the intended use of the deck and designs a structure required to support your individual and personal needs. It is important to discuss all potential future uses of your deck as home owners often wish to retrofit heavy accessories such as hot tubs or spas. We only use stainless steel fasteners and quality materials in our decks with a proven track record of longevity and performance. The Morrison engineer works directly with each homeowner to assure the completed deck layout meets all governmental permitting requirements. 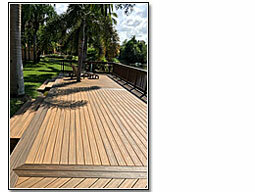 All Morrison decks use pressure treated pine supporting framework as required by Florida building codes. The topsides and railings can be constructed of pine, exotic wood or plastic composite decking. Wood decks can create a beautiful high end patio with a distinctive Southern feel. Wood topsides require regular cleaning, sealing and maintenance and have a normal lifespan of about 10 years. Composite decking requires no maintenance and lasts well over 20 years. Morrison Contractors is a Trex Pro Platinum Dealer. Trex is the industry leader in composite decking. Their products are created from recycled materials recognized for their low maintenance and long lasting beauty. Deck railings are required for any deck with an elevation over 2 feet above the ground. Deck railings vary in design and functionality. They can be a significant decorative element to your home and much more than a safety factor. 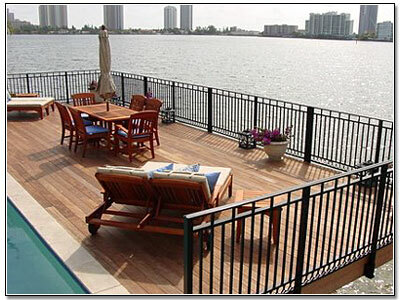 A deck railing is a wall like structure that can surround and enhance the look of a patio area. Deck railing options vary from significant additions that can be used as a leaning post to nearly invisible cable, metal or rope railings. Significant additional features of a custom deck may include stairways, lighting, ramps and/or custom benches or platforms. Hot tubs and pools can be enclosed with a custom deck adding warmth and design to normally standalone elements. Tiki huts, boat docks, lifts and marine ladders can also be incorporated into a custom deck design theme. A custom deck can change an otherwise ordinary back yard into a tropical paradise. Whatever you needs and desires for your custom deck, Morrison Contractors is ready to make them a reality.